There exists an old adage, “familiarity breeds contempt”. While my own view is that it can also be a stimulant for compassion, I think the adage can be applied to almost every profession today – politicians, lawyers, bankers, accountants, police officers and so on. But for me – in both a professional and news-watching sense – the profession of which I have become most contemptuous is without doubt that of the economist. It says a great deal about the practice of economics that – of the last four shocks the capitalist system has undergone, and the collapse of the USSR – not a single ‘respected’ economist saw them coming. As an adman, I worked alongside client economists, all but two of whom seemed expert at explaining the past, but never had less than eight alternative views on the future. The two that were usually right about what was coming formed their own companies – going on to work on a hugely successful multiple retailer transformation in one case, and developing a brand-leading product innovation on the other. While at University, I was obliged to take Economics as a subsid to my joint honours for the first year. The subject was taught by a likeable Canadian whose syntax was nevertheless so strangulated, I had not a clue what he was on about. His favourite theme (this was 1966) involved explaining why, by 1980, nobody would own a car, and investment efficiencies would ensure that few people would bother having a job after the age of 45. The future, he asserted, would be one in which the major challenge would be everyone on Earth being too rich and self-satisfied: manufacturers would be starved of both labour and markets via which to produce their goods. The starting point of the course in the Fresher Term was Marxism. At this point in the Sixties, everyone was waving Mao’s Little Red Book, then the following year waving joss-sticks, and the year after that chucking pavés at the Paris cops. It was all very eclectically radical – or, to put it another way – a muddled series of intellectual crazes. From day one, it was hard to take Marxism seriously. At its heart lay the idea of dialectical materialism, an invented piece of bunk which insisted that economic history consisted of a thesis, an antithesis, and then a synthesis. So we’d gone from agrarianism to capitalism, and now had arrived at the perfect system, communism. Soon, Marxists insisted, there would be a “consensus for socialism”, and then the organs of the State would “wither away”. All this stuff was being spouted just ten years after the Soviet subjugation of Hungary, and two years before the USSR invaded Czechoslovakia to displace Aleksander Dubcek, a brave man who had tried to give socialism ‘A Human Face’. As Orwell had predicted, the Kremlin stamped on his face, and he died two decades later in abject poverty. The problem with dialectical materialism (dm) is that you can apply it endlessly to history…but everything changes depending on where you start the clock ticking. Thus I can assert that Britain’s dm political process has been one of tribal chiefs, Divine Right Monarchy, and now the synthesis – which is, natch, liberal democracy. Or – if I press the stopwatch at 1215 – it is one of declining Divine Right Monarchy, Parliamentary sovereignty and then Mammonesque Oligarchy. I prefer the second version, but only because it’s what I think. And I didn’t get through that thought process using dm: I got there by a combo of empirical observation, and then interpreting that in the context of what Homo sapiens is about. The trouble with most economists (and politicians) is that they know diddly-squat about social anthropology. And nowhere is this more true than economists who emanate from acadaemia. 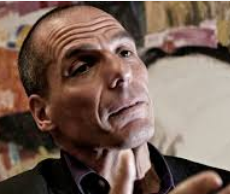 I’m indebted – as so often – to Athenian friends who pointed me at a speech made yesterday at the Ambrosetti Conference by Greek finance minister Yanis Varoufakis. I’ve followed this bloke’s blog for some time, and on the whole found him both sound and creative. But there’s something about Yanis since he became famous that’s turned him into what one can best describe as a chap trying to be Le Rockstar on many different levels. In the weeks leading up to the Greek elections, he was the radical stylist, hell-bent on destroying the Greek oligarchy. Immediately after his appointment as finance minister, he became whistle-stop casual diplomat and proletarian style-magazine icon. After a few weeks of dealing with Troika2, he was Game Theory Star, rationalising his weekly routs as tactical Chinese General retreats. Of late, the retreats have turned into retweets as Varoufakis tries desperately to suggest he’d love to have Schauble’s babies, and finds Dijesselboomerang a nice person really no seriously, he does. I really do need someone to tell me WTF decentralised europeanisation is. Has Yanis, I wonder, failed to notice that this has been the very thing splitting Parties of both Left and Right from the early 1970s onwards? Perhaps he has, for the proposal he offers us ‘a federal euro governance without federation’. Does he really think that Wolfie’s Fiskalunion is going to be a light-touch version of this ethereal unfederated federation he envisages? The second half of the para follows a route heavily trodden by the UK Conservative Party…a route that would be found unacceptable by Eurosceptic Parties across the continent. And consistently, the Eunatics have made it clear: this “we’re in but also a bit out” is not acceptable to them either. When he first exploded onto the scene in January, Mr Varoufakis seemed to me – and millions of others – like a breath of fresh air. With every week that passes, he looks more like a froth of hot air. Connected at The Slog: Was it the iceberg or the shipowners that killed 1500 passengers? This entry was posted in Article, Links, reblog and tagged 15 March, 2015, Disclosure, Euro Economics : The Increasingly Odd Visions Of Mr Varoufakis, John Ward, news, spiritual, Spiritual evolution, World. Bookmark the permalink.